If you are anything like me, one of the biggest challenges in crafting is deciding which project to start first as there are so many ideas out there. In fact, that's one of the reasons I stared the Happy Barnet Craft Challenge as I hoped it would help me focus on certain projects whilst encouraging me to try new things throughout the year. 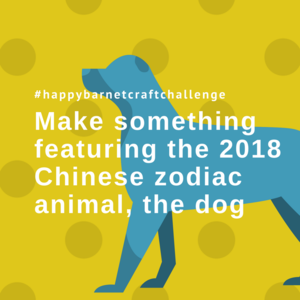 One of the challenges I've been most excited about is in the yellow "fun and inspiration" challenge list: "Make something featuring the Chinese zodiac animal of the year: The Dog". If you know me in real life (or online!) you'll know I'm a big dog lover so this really appeals to me. 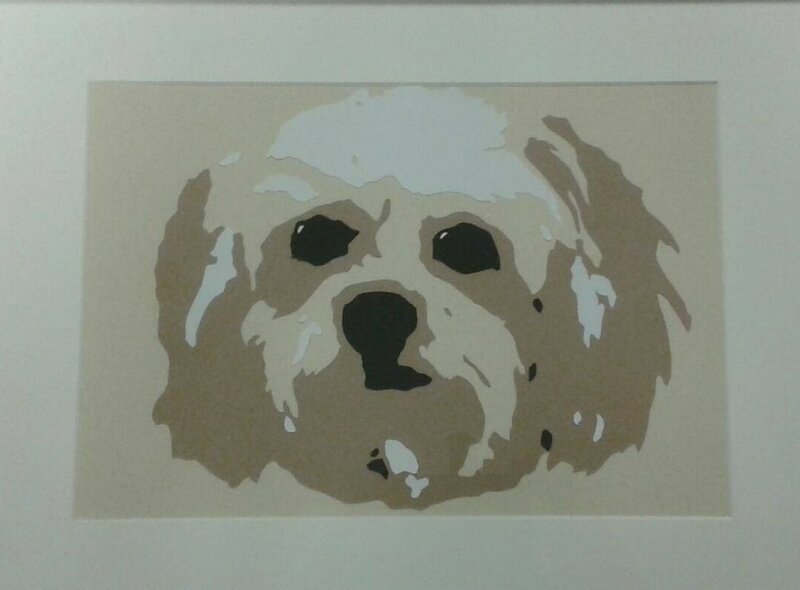 The only dog themed project I've made to date was a paper cut portrait I made of my friend's dog, Murphy, for Secret Santa at work so where do I start this year? So far I've been favouriting, pinning and saving lots of project ideas as I have for all the challenges and I thought I'd start writing a blog post around each challenge and share some of my ideas with you. If you have any ideas or want to get involved in the Happy Barnet Craft Challenge. Follow the #happybarnetcraftchallenge tags and join us in our Facebook Group. We are a mix of all different types of crafters with different levels of experience. What's really great is we all have huge levels of enthusiasm and lots and lots of ideas and support for each other when we get in a pickle! Given it's the only doggy themed craft project I've made I'm starting with paper cutting. Here are a couple of templates I found on my favourite sites which show the variety of styles you can try out. For more you can also look through etsy. And as for the layered paper cut style I used for my Murphy portrait. I bought the layered paper cut software from Paper Panda and uploaded a photo to produce the various templates for each layer. As this was my first attempt I chose to go for a small number of layers but you can make it as simplified or complex as you feel comfortable with. The more layers, the more detail of course! I love Toft! They were my favourite stand at the 2017 Knitting and Stitching show in Edinburgh and I love seeing their gorgeous patterns on instagram. A friend (and fellow challenger) has their original Edward's Menagerie book and the things she's made are stunning! Their latest book is perfect for crocheting challengers as it's all about.........., you guessed it, DOGS! You can also buy individual kits for specific dogs - gorgeous! If you haven't tried amigurmi before, trust me, it's not as hard as it looks. My top tips are: you will need peace and quiet to get started, it's all about counting! Use a stitch marker, you WILL lose count! The invisible decrease makes a difference and Planet Jane has a great way to finish off projects. There's so many different things you could sew of course so I've just picked a few suggestions which I hope will inspire you. One of my big goals this year is to get more confident with my sewing machine and move beyond bunting! If you have patterns/ideas you think would get me started, I'd love to hear them! Doggy door stop - so cute I may need to make one for every door in the house! Dog Gone Cute quilt blocks - I REALLY want to learn to quilt so this appeals to me! Dog coin purse - quite possibly, too cute. It seems quite a few of our challengers fancy trying felting and as a crocheter the first pattern I've shared showed me the difference adding some felting can make to my own work. It definitely seems like a craft where you really get to put your own creativity into it and shape things with your own imaginative ideas. Crochet and Felting Schnauzer - look at that face! The felting makes such a difference to this project. Cute puppies - described as "for beginners" and the fact they are not so realistic takes the pressure off the finished article! Little Felted Dogs (Book) - good reviews but a mix on whether it's great for beginners or not. As usual, I would suspect a youtube video or workshop would go a long way to get you started! Felted portraits - a totally different style to those above. As they say, it's almost like painting with wool. I've never done any embroidery since school but really admire the work done by crafting friends of mine so I should really consider giving it a go. I've tried to include a few different styles here...my favourite is probably the second one - I love simple and bold patterns like this. I hope these have inspired you and would love to see what you make. Don't forget to tag it #happybarnetcraftchallenge and share it in our Facebook group and if you have any ideas you'd like to share, especially for crafts I've not included above, I'd love to hear them...I've still not decided what I'm doing yet!